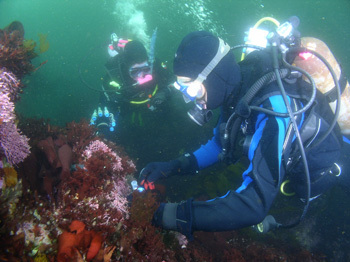 Laura Sanchez and Roger Linington collect samples in Monterey Bay. Photo by Steve Clabuesch. Researchers at UC Santa Cruz have received a grant from biopharmaceutical company Gilead Sciences Inc. to support a collaborative drug discovery program using UCSC's unique collection of marine natural products. The grant will fund work in the natural products labs led by chemists Roger Linington and Phil Crews and in the UCSC Chemical Screening Center. Gilead focuses on the discovery, development, and commercialization of treatments in areas of unmet medical need. The company is particularly interested in identifying compounds with potential antiviral activity in the areas of HIV and hepatitis. Crews, a professor of chemistry and biochemistry, is a pioneer in the search for novel molecules from tropical marine organisms. Linington, an assistant professor of chemistry and biochemistry and principal investigator on the grant, has established a drug discovery platform at UCSC based on marine-derived bacteria. The Gilead grant is helping them add to their collections of chemical extracts and speed up the production of chemical "libraries" that can be efficiently screened to identify compounds that might be developed into new drugs. "We will dramatically expand the scope of our libraries of natural products. This will benefit Gilead in their search for new antivirals, while building the foundation for other drug discovery programs involving UCSC researchers and their collaborators," Linington said. The project creates a collaborative partnership involving the natural products labs, the UCSC Chemical Screening Center, and Gilead. "Because of the synergies in this project, we are poised to make significant contributions to the discovery of antiviral lead compounds," Crews said. "We are intrigued by the potential of novel molecules derived from marine organisms to inhibit human viruses. This is an unexplored area that needs to be investigated, and Drs. Crews and Linington at UCSC are recognized leaders in the isolation and identification of these molecules," said William Lee, senior vice president for research at Gilead. The UCSC Chemical Screening Center is performing preliminary screening of compounds from the Crews and Linington labs, testing them for toxicity to human cells. The screening center has an array of specialized robotic equipment that automates the processes involved in handling and screening large numbers of chemical compounds. Scott Lokey, director of the Chemical Screening Center and associate professor of chemistry and biochemistry, noted that pharmaceutical companies are increasingly turning to academic collaborations for help in the early, high-risk stages of drug discovery. "They don't have the resources to develop a natural products program on their own, and we don't have the resources to take an interesting compound and move it into clinical development, so it's a win-win," he said. "Having a partnership with a pharmaceutical company means that something we discover here could translate into a clinically useful drug, and that's really exciting." Earlier work in the Crews lab identified promising compounds for cancer therapy, including a novel sponge-derived compound that was passed on to an industry team for development in human clinical trials. The Gilead project is the first to explore the lab's extensive collection of natural products for antiviral potential. Linington's lab focuses on compounds isolated from bacteria living in marine sediments. His lab expects to increase the number of prefractionated extracts in its repository from about 600 to more than 5,000. "These natural product libraries represent a unique source of new chemical entities for drug discovery that are only available through the UCSC Chemical Screening Center," Linington said. The combined efforts of the Linington and Crews labs are expected to yield a natural products repository at UCSC containing a total of about 200,000 discrete chemical entities that can be screened for potentially useful biological effects. Both labs are involved in ongoing collaborations with biomedical researchers to explore their libraries of chemical extracts and pure compounds for potential drug candidates. "Our lab is especially interested in drug discovery for global health problems and neglected diseases, including malaria, cholera, and African sleeping sickness," Linington said. "The Gilead grant supports that effort as well as their search for antivirals." Gilead Sciences is a biopharmaceutical company that discovers, develops and commercializes innovative therapeutics in areas of unmet medical need. The company's mission is to advance the care of patients suffering from life-threatening diseases worldwide. Headquartered in Foster City, California, Gilead has operations in North America, Europe, and Asia Pacific. The UCSC Chemical Screening Center was established in 2007 with funding from the National Institutes of Health, the U.S. Department of State, and the California Institute for Quantitative Biomedical Research.